You need to know how to monitor what your customers owe you and how to assess finance charges. Don’t worry, though. You can track what a customer owes in a couple of ways. Probably the simplest method is to display the Customer Center by choosing Customer → Customer Center. Next, select the customer from the Customers & Jobs list (which appears along the left edge of the window). QuickBooks whips up a page that lists transactions for the customer. It also shows the customer’s contact information. This figure shows the Customer Center information for a customer. 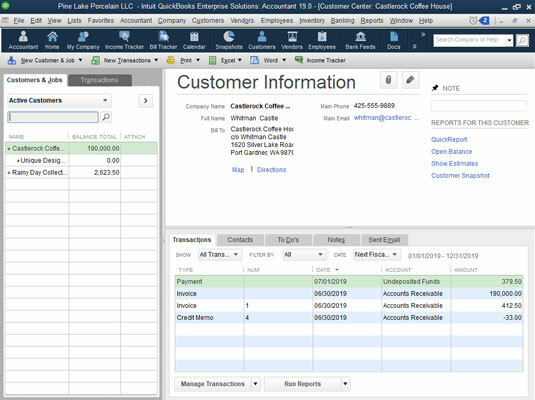 You also should be aware that QuickBooks provides several nifty accounts receivable (A/R) reports. You get to these reports by clicking the Reports icon and choosing Customers & Receivables. Or you can choose Reports → Customers & Receivables. QuickBooks then displays a submenu of about a half-dozen reports that describe how much money customers owe you. Some reports, for example, organize open invoices in different groups based on how old the invoices are. (These reports are called agings.) Some reports summarize only invoices or payments. And some reports show each customer’s open, or unpaid, balance. You can print a statement to send to a customer by choosing Customers→Create Statements. Use the Create Statements dialog box to describe which customers you want to print statements for and the date ranges you want the statements to show; then click Print or Email to print or email the statements. Statements are handy ways to remind forgetful customers or clients about overdue amounts. By the way, you don’t need to send statements to everybody for every month. In my CPA practice, I send out statements a couple of times a year to clients with past-due accounts. This friendly reminder always produces a handful of quick payments and awkward apologies. 1. 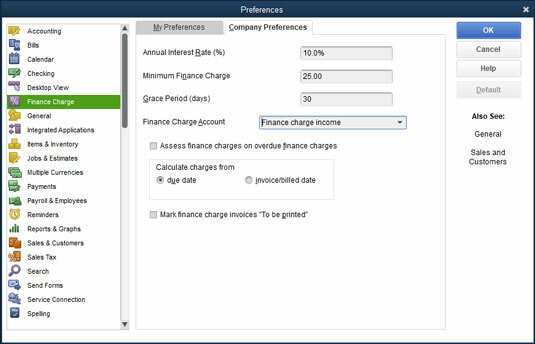 Choose Edit → Preferences, click the Finance Charge icon in the list on the left, and then click the Company Preferences tab. 2. Enter the annual interest rate that you want to use to calculate finance charges. Move the cursor to the Annual Interest Rate (%) text box, and enter the annual interest rate. 3. (Optional) Enter the minimum finance charge, if one exists. Move the cursor to the Minimum Finance Charge text box, and enter the minimum charge. If you always charge at least $25 on a past-due invoice, for example, type 25. 4. Enter the number of days of grace that you give. 5. Specify which account you want to use to track the finance charges. Activate the Finance Charge Account drop-down menu, and choose an Income or Other Income type account. 6. Indicate whether you want to charge finance charges on finance charges. Does this statement make sense? If you charge somebody a finance charge, and he or she doesn’t pay the finance charge, eventually, that charge becomes past due, too. So, then what do you do the next time you assess finance charges? Do you calculate a finance charge on the finance charge? If you want to do this — and if state and local laws permit you to — select the Assess Finance Charges on Overdue Finance Charges check box. 7. Tell QuickBooks whether it should calculate finance charges from the due date or the invoice date. 8. 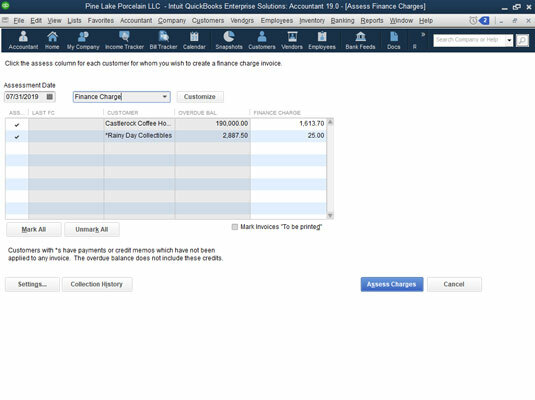 Tell QuickBooks whether it should print finance charge invoices. Select the check box titled Mark Finance Charge Invoices “To Be Printed” if you want to print invoices later for the finance charges that you calculate. 10. Choose Customers →Assess Finance Charges or click the Finance Charges icon on the home screen. The Assess Finance Charges window appears, as shown. This window shows all the finance charges that QuickBooks has calculated, organized by customer. 11. Enter the finance charge assessment date. 12. Confirm which customers you want to be assessed finance charges. 13. Click the Assess Charges button. When the Assess Finance Charges window correctly describes the finance charges that you want to assess, click Assess Charges. You’re finished with the finance-charge calculations and assessments. While I’m on the subject of improving your cash flow, let me briefly mention one other powerful cash-flow technique — and discuss the bookkeeping required for that technique. One easy way to improve your cash flow is to accept or require up-front deposits or retainers from clients or customers before you do the actual work. In other words, before you begin work or order inventory or do whatever is the first step in your business for completing a sale, you collect cold, hard cash. The Precise Way: You can recognize the deposit as a new liability. You do this by creating a journal entry that records the increase in your cash account and that records the increase in your Customer Deposits current liability account. If the deposit is refundable and you’re a cash-basis taxpayer, or if you’re an accrual-basis taxpayer, you probably should use this method. When your sale is completed and invoiced later, use the Customer Deposit item as a minus amount in the sales invoice to move the amount from the liability account and apply it to the invoice balance due.